Beautifully engraved certificate from the Utica and Black River Railroad Company issued in 1890. This historic document was printed by the American Banknote Company and has an ornate border around it with a vignette of a train next to the Black River. This item is hand signed by the Company’s President and Secretary and is over 112 years old. The Black River and Utica Railroad Company was incorporated January 31, 1853, and opened in December, 1855. It was sold under foreclosure proceedings March 30, 1860, to the bondholders, who, on May 22, 1861, incorporated The Utica and Black River Railroad Company, which was opened to Philadelphia in February, 1893. On November 16, 1883, the Black River and Morristown Railroad Company, incorporated March 22, 1870, and opened in October, 1873, was merged by consolidation; and on March 31, 1886, The Ogdensburg and Morristown Railroad Company, incorporated July 17, 1871, opened August 1, 1878, and the Clayton and Theresa Railroad Company, incorporated February 7, 1871, and opened in October, 1873, were merged by consolidation. 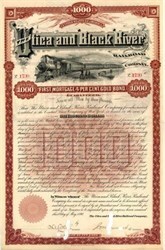 Under date of April 14, 1886, the railroad and property of The Utica and Black River Railroad Company were leased to the Rome Watertown and Ogdensburg Railroad Company at an annual rental of seven per cent dividend on outstanding capital stock, interest at four per cent on $1,950,000 mortgage bonds and $4,500 in cash. This lease was assumed by The New York Central and Hudson River Railroad Company when, on March 14, 1891, it leased the railroad and property of the Rome Watertown and Ogdensburg Railroad Company. Consolidated April 16, 1913.